Check out the movie we put together showing some of the highlights from our WW1 inquiry. Team Pango has gone Crazy... oh hold on its just kitchen Science fun! Room 6 was buzzing with excitement as we predicted what all the ingredients might be used for. We all tried the different ingredients individually, some were sour and some were sweet. Next we combined all the ingredients and tried it again... YUM. The flavours combine created a fizzy, fluffy feeling on our tongues. 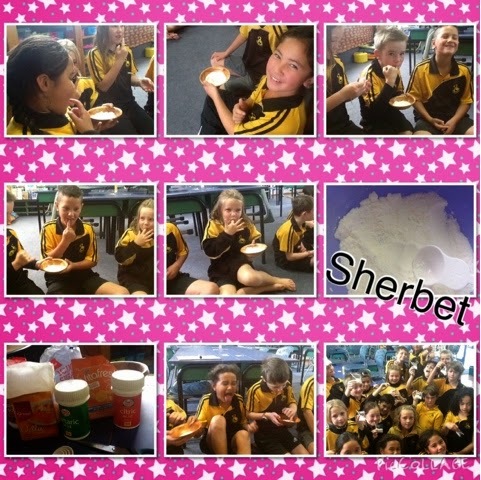 We had a great discussion around why Sherbet reacted this way on our tongue. Come into room six to see our results displayed in the classroom on our Food Science Wall. 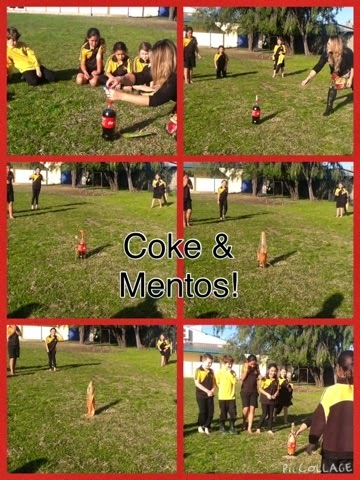 Continuing our investigations into chemical reactions were thought we would try out the Coke & Mentos experiment. We used a 2 liter bottle of coke and 7 Mentos (the plain ones). Our reaction was o.k, we predicted it would go higher. We are going to try it again using Diet Coke. We wonder if this will make a difference? We are exploring chemical reactions. 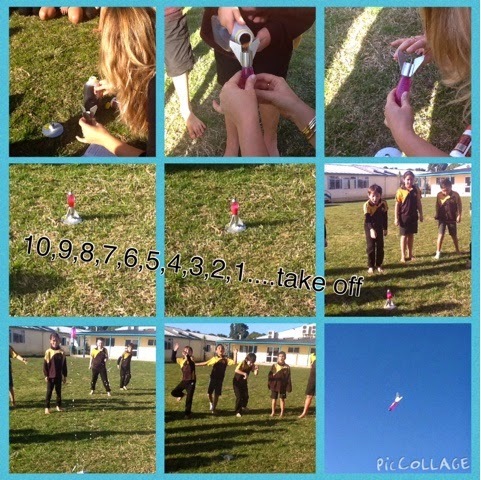 In the base of the rocket we had baking soda then the rocket was filled 1/3 with vinegar. Very carefully but quickly we placed the rocket onto its base and moved away. In a matter of seconds the reaction occurred sending the rocket flying in to the air. Our exciting visit to the Mind Lab was MIND BLOWING! Room Six is full of budding computer programmers and Robotic creators. Words can not describe how much fun we had. Here are some pictures and movies of our fun! Thank you Miss Beattie for joining us in our adventure at Mind Lab. A big thanks to the team at Mind Lab for teaching us new skills. See you again in Term 3! Click Here to view the latest Room 6 newsletter. We love going to the town library, its a real highlight for us all. Here are some very happy children who swapped their books for new ones. A few weeks a go we had a visit form Mrs Kemp. She shared with us a range of different equipment soldiers would have used in the war. Mrs Kemp had a surprise for us all...she brought in some cabin bread and bully beef for us to try. Yum, yum, yum. We all wanted seconds!